My affection for Bruce Springsteen's music dates back to my pre-teen years when my musical tastes first started to take shape. Along with Bryan Adams and Whitesnake, he was one of the first artists that I became a true fan of. If I was to put together a soundtrack of my life, all three would have multiple entries and they all continue to remain special to me. 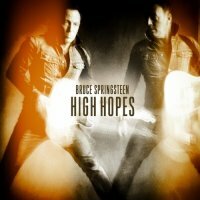 However I was a little sceptical about 'High Hopes' once I found out it was a collection of covers and re-imagined existing songs. Given Sky had recently been heavily advertising and subsequently shown the Ridley Scott documentary 'Springsteen And I', the cynical side of me was suspicious of a hastily cobbled together cash in. That said, Springsteen states that he had been working on a "best unreleased material" record for the past decade. Either way there is a lot to like about '...Hopes'. It's worth noting all twelve tracks are fully produced and completed songs thus avoiding the inclusion of any demos or unfinished rarities. The fact that all the choices are lesser known Springsteen songs, and not re-worked "hits", also goes in the album's favour. Seven selections feature guitarist Tom Morello (Rage Against The Machine) who Springsteen credits with being a major inspiration behind the album's completion. The title track is a cover (The Havalinas) that was previously recorded by Springsteen in 1996 and has now been re-cut due to Morello's inspired performances. 'Just Like Fire Would' (The Saints) and 'Dream Baby Dream' (Suicide) are other covers included for the same reason whilst 'Ghost Of Tom Joad' seemed an obvious choice given it appeared on the Machine's 'Renegade' album. The likes of 'Harry's Place' (musically reminiscent of a 1980s soundtrack song) and 'Down In The Hole' (sounds spookily like 'I'm On Fire' in places) are songs that were originally written for other albums but didn't make the final cut. My favourite entry is 'American Skin (41 Shots)' which is a studio version of a beautiful song that originally appeared on 'Live In N.Y. City'. I was lucky enough to bag the limited edition copy that came with the excellent 'Born In The USA Live' DVD which was recorded in London last year. It shows Springsteen and Co working their way through the ten tracks from 'Born...' (in order) and having a ball as they do. Just check our Springsteen and Steven Van Zandt during 'Glory Days' for proof of this. 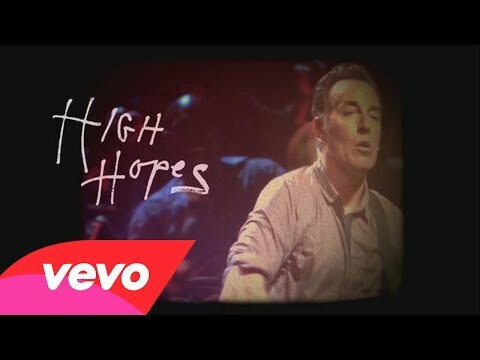 'High Hopes' is conventional Bruce Springsteen and as such it will probably be a love or hate affair for many readers as is so often the case with his music generally. But as a fan, I found this an entertaining album that I really enjoyed, even if it isn't up to the standards of 'Born...', 'Tunnel Of Love' or even 'The Rising'. If you are also a fan, as a fellow enthusiast, I can confirm this is worth investigating; especially if it has the DVD.